Marc Chagall (1887-1985) was a celebrated Russian-Jewish artist whose work crosses the boundaries between styles, employing elements of Expressionism, Impressionism, and Primitivism, among others. Born in Vitebsk, now in Belarus, and having lived in Moscow, St. Petersburg, New York, and Paris (where he spent most of his life), the artist had a unique perspective on the changing nature of Jewish and European life in the twentieth century. Chagall used vivid colors and fantastical folk imagery, raising serious questions about the nature of home, time, memory and longing. 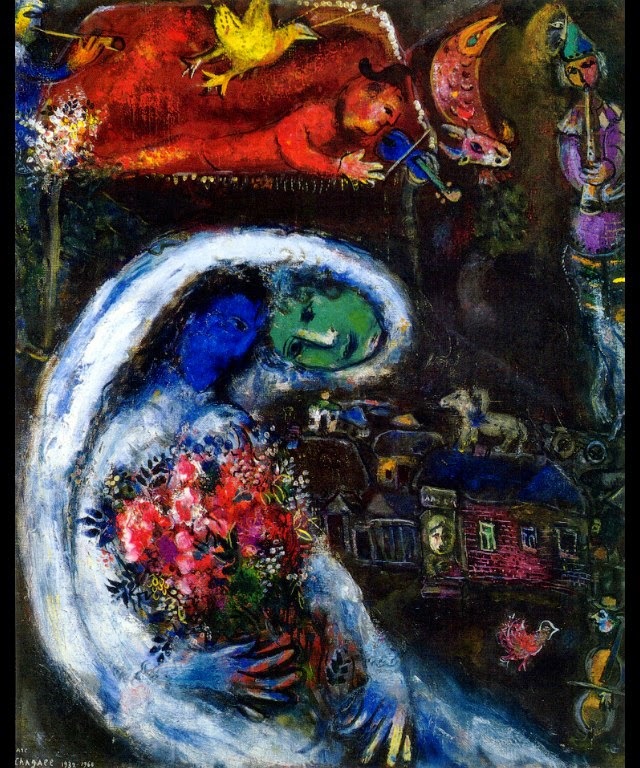 Bride with Blue Face is exemplary of Chagall’s unique style, with vivid colors, disjointed space, personal themes, and unusual animals. Here we see a bridal couple, one of the artist’s favorite subjects, towering over a village. The groom's head is quite puzzling; it seems to be floating, supported only by the bride's veil, as though the groom's presence is not entirely realized and he is unable to join his bride. The groom seems to dwell in the past, represented by the village in the lower right, and the burning village at the top. The bride keeps him rooted to her present with her veil.